(1) The total or net force i.e. the vector sum of all the forces, on the rigid body is zero. (2) The total Torque i.e. the vector sum of the torques on the rigid body is zero. For m.e. these 6 independent conditions are to be satisfied. We need only 3 conditions to be satisfied for this when the forces working on the rigid body are coplanar. A body may be in this condition. It means that the body may be in translational equilibrium but not in rotational equilibrium and vice versa. AB is a light rod and C is its midpoint. So CA = CB = r (say). At point A a force is applied downwards and at B same amount of force f is applied but in opposite direction. But what is the net Torque? Say at point A the torque is T1 and at point B it’s T2. 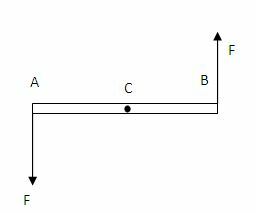 T1= F r .
Similarly T2 = F r. (both torques trying to move the rod anticlockwise). So certainly net Torque on the rod is non zero. in this case, both the forces at point A and B are equal (F) like case 1 but this time both are working in the same direction (downwards here). As a result, the net force is nonzero. Let’s consider the torques now. At point A and B magnitudes of the torque are same, i.e. r F. but in this case their directions are opposite to each other. 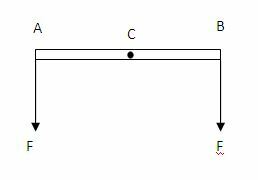 At point A the torque tries to move the rod anticlockwise, at point B the torque plays clockwise. Therefore, in this case net torque is zero. A pair of equal and opposite forces with different lines of action is known as a couple. A couple produces rotation without translation. Example of couple; When we open the lid of a bottle by turning it, we apply a couple to the lid through our fingers.